Chicken salad... I am all about plain chicken salad. Nothing fancy, no raisins or grapes, and especially no nuts. 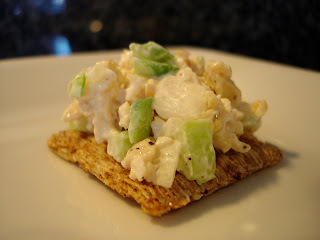 I make my chicken salad with a bit of mayonnaise, onions, celery, and green peppers. So why am I posting? I like how I cook my chicken for the salad. 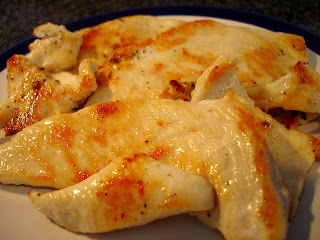 I only use boneless chicken breasts, and before cooking, I coat them with salt, pepper, a touch of thyme, celery salt, and onion powder. I cook the chicken on high heat so it gets crispy and golden brown. Sometimes I shred it, but today I chopped it into tiny pieces. I have leftover rye bread from breakfast that will make a great sandwich. Back to the kitchen - time to start my hummus and then I'll be making broccoli-mascarpone soup. The London broil we're having for dinner is marinating in one of Jon's creations and I'll be making risotto to go with it. I love days like this where I can spend the day in the kitchen prepping for the week. More posts to come! i agree abuot the plain chicken salad. raisins? grapes? nuts? no thank you! i've never tried green peppers though... i'll have to try it!